The Micro Four Thirds mount Rokinon 24mm f/1.4 ED AS IF UMC Lens is a prime standard-length lens designed for Micro Four Thirds sensors. Providing a 35mm-equivalent focal length of 48mm, this lens is well-suited to everyday shooting situations. Its fast f/1.4 maximum aperture is further beneficial to working in low-light conditions and for greater control over selective focus and shallow depth of field effects. Two aspherical elements have been incorporated into the optical design to minimize chromatic aberrations in order to produce sharper images. A UMC coating has also been applied to lens elements to reduce surface reflections and prevent lens flare and ghosting for improved light transmission and more contrast-rich imagery. Additionally, the lens' manual focus design incorporates an inner-focusing mechanism to maintain the overall lens length when changing focus. Standard-length, 48mm equivalent prime lens provides a similar field of view to normal vision, making it well-suited to use in everyday situations. Fast f/1.4 maximum aperture benefits working in low-light conditions and provides greater control over focus placement for shallow depth of field applications. Four extra-low dispersion elements and two aspherical elements reduce chromatic aberrations in order to produce greater sharpness and clarity. Inner-focusing mechanism maintains overall lens length while focusing and helps to prevent dust from entering the lens barrel. Eight rounded aperture blades help to produce an aesthetic out-of-focus quality to benefit selective focus and shallow depth of field imagery. Box Dimensions (LxWxH) 8.8 x 6.9 x 4.8"
24mm f/1.4 ED AS IF UMC Lens for Micro Four Thirds Mount is rated 4.0 out of 5 by 1. Rated 4 out of 5 by the BioHazard from Fully capable, auto focus not needed I intended to use this lens for night and low light shots and it delivers for that. Nicely sharp from f2 on and at f1.4 it gives a look that most will find pleasing. Difficult to gauge bokeh rendered from this lens, but in general it has been acceptable for me. Manual focus ring seems nicely damped; it is not focus-by-wire like many of the electronically coupled four-thirds lenses. Focusing the lens is easy with micro four-thirds cameras even at smaller apertures due to gain-up by the electronic viewfinder in low light and the possibility of magnification of the focus area.Disadvantages are that the lens is about the same size as standard cropped sensor and even full-frame SLR lenses. It isn't overwhelmingly heavy, but it's easily twice the weight of fast 25 mm lenses from Olympus or Panasonic. There are half-stop clicks for all apertures EXCEPT between f1.4 and f2 but this will be a very minor disadvantage for most. Not the focal length many would choose for portraits, but I've tried a couple and results are pretty solid. If you aren't put off by the limitations of the lens, I would recommend the Rokinon. Can this lens be used in a Fujifim X-2Es? This lens is not compatible with the Fuji X-E2s. Can this be used with a LUMIX G7, Canon 80D, and an USRA Mini Pro 4.6k? 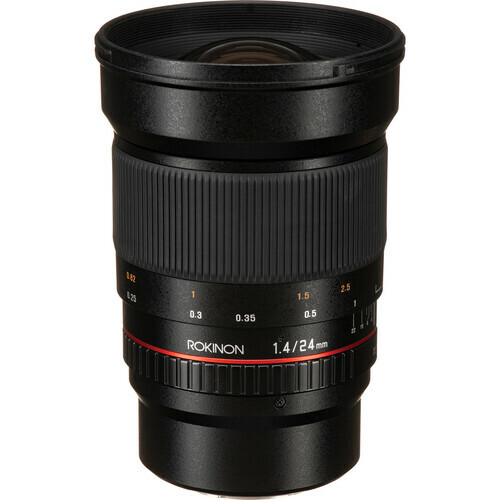 The Rokinon 24mm f/1.4 ED AS IF UMC Lens for Micro Four Thirds Mount, B&amp;H # RO2414MFT, is a manual focus lens that is designed for use on cameras that use the Micro Four Thirds lens mount. As such, the Rokinon 24mm f/1.4 ED AS IF UMC Lens for Micro Four Thirds Mount would be compatible for use on the Panasonic Lumix DMC-G7 Mirrorless Micro Four Thirds Digital Camera, but it would not be compatible on either the Canon EOS 80D DSLR Camera nor on the Blackmagic Design URSA Mini Pro 4.6K G2 Digital Cinema Camera, both which use the Canon EF lens mount. If you are looking for the comparable lens that would be compatible on the Canon EOS 80D DSLR camera and the Blackmagic Design URSA Mini Pro 4.6K G2 Digital Cinema Camera, then I would instead recommend the Rokinon 24mm f/1.4 ED AS UMC Wide-Angle Lens for Canon, B&amp;H # RO2414C, for your usage needs as this model is designed for use on the Canon EF lens mount.